Last week I went to see an interactive play at the wonderclub in stokes croft. It was a lovely night, full of brilliant set designs, dramatic lighting and some top notch acting skills. "an extraordinary site specific performance. We make exciting interactive promenade theatre, bringing to life installation art from some of Bristol's leading artists we merge theatre, music and performance art tied together by a narrative that allows you, the audience to find, play with and gossip about." this kind of unique experience is something i love to get my teeth into ever since i saw a version of Edgar Allen Poe's 'masque of the red death' at the battersea arts centre a couple of years ago. This play was perhaps the most amazing theatre experience i have ever had. The atmosphere was electric- with every member of the audience wearing a plain white grotesque mask, and after a visit to the tailors, a black velvet cloak to match. The music was intense and constantly building making you chase each character around the set, through wardrobes, out of fire places, visiting each room more than once and finding it changed, the action having moved on to another space. It was fantastic. 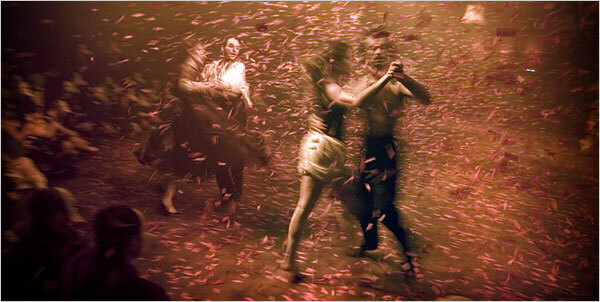 in close competition was fuerzabruta an intense piece of interactive theatre at the round house in london. The audience spent the entire night watching around them and above them as characters emerged form within us and stages moved around the space. this was accentuated by a constantly running man on a conveyor belt in the centre of the room, coupled with foil walls dropping down around us and people rushing sideways, swooshing and banging against the wall. The water was something i never expected. but it made the night unforgettable. watch this video on the website to get an idea of the intense experience. well done wonderclub for such a good show last week. pictures: fuezabruta and masque of the red death.